My family and I traveled to Colorado for the summer. 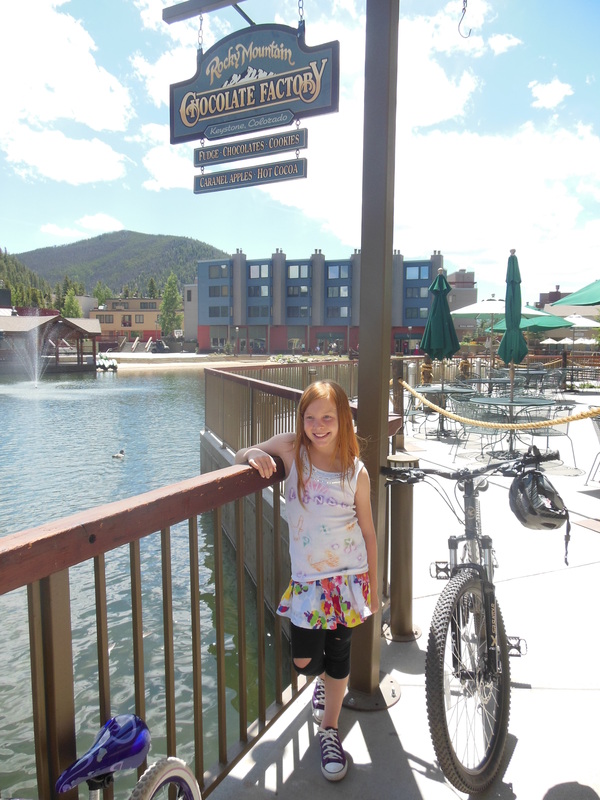 We did paddle boats, we hiked Mohawk Lake, I learned how to knit, we saw our cousins, and went to Breck Fun Park, but my favorite thing that we did was visit the Rocky Mountain Chocolate Factory. I loved getting some alone time and riding my bike through the cool air, passing the river, and going through the trees on my way to the chocolate factory. I liked riding by myself not with my mom in the car. It was mostly a downhill ride with candy waiting for me. When I got there, the store was filled with lots of colorful candy and it smelled like chocolate cake. All of the sweet, sweet candy piled up in shiny glass jars. My favorite candy to buy is sour gummy worms. The lady at the counter is so friendly with her happy smile. She is so nice- sometimes she sneaks and lets me buy candy under-price. For example, if the total was $3 and I had $1.50 she’d take my $1.50. After I pick out my candy, I go outside and feed the fish in the beautiful lake. It is so cool to see the fish shine silver in the calm water. When I put in the quarters and turn the shiny knob, the fish food comes out and it stinks! That’s what I remember from the Rocky Mountain Chocolate Factory. I enjoyed your writing, Lindsey! I think the candy store lady must love her job a lot so she enjoyed the smiles you gave her in return for the special prices she gave you on the candy. Thanks for sharing your story!! Have fun on your travels!! Hi, Lindsey and family! I love reading your stories. Thank you for sharing your wonderful (and tasty – mmm Chocolate Factories!) experiences. Although you are all missed, these precious times you are having are invaluable! I am so happy for you! Can’t wait to see the red hair and the smiles again soon.